“I had never trekked before in my life”, says Chef Vineet Bhatia. 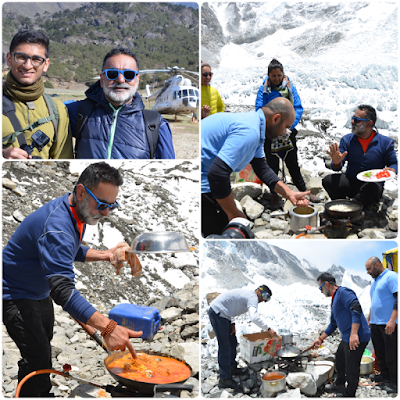 Yet, this Michelin starred chef climbed up till the Everest Base Camp where he and his team set up the most memorable dining experience at 17,600 feet! The 3-day pop-up was held from 3rd-5th June, 2018. On the first two days the team fed fellow trekkers. The third day saw a lavish meal laid out for diners who had specially flown in for the event. Since it was a charity event, the meal itself was priced at USD 1500 per person, while the logistics of reaching there constituted an additional cost. Chef Vineet confesses that the original idea came from an Australian chef who wanted to set a world record of hosting the highest pop-up restaurant at the Everest Base Camp (EBC). Since he couldn’t get the requisite funding (it requires USD 15,000 to apply for a world record plus many more expenses involved) he approached Chef Vineet Bhatia for the same. Being an internationally recognized chef, Chef Vineet started getting all the media attention for this project. The Australian chef got miffed and pulled out of the project. It was then that the idea of cooking for charity, instead of a world record, took shape. While we closely follow this jetsetting chef’s journey all over the world through his active social media accounts it is evident that he spends a chunk of his time cooking for charity events. One of the charities that he supports ardently is the Heart For India Foundation that works actively in Chennai, to help provide education to underprivileged children from 3 to 18 years and vocational training diplomas and job recruitments for young women. Although he himself spent a significant amount of money on this trek, the entire proceeds have gone to Heart for India Foundation. The earnings from the documentary that was filmed during the entire trek and pop-up will also follow suit. “Although I have travelled extensively, I had never trekked in my life,” says Chef Vineet. Eight weeks prior to the trek he started working on increasing his stamina and doing cardio-training for almost two hours every day. “I walked on the highest incline on the treadmill, with a 15kg backpack,” he says. This was important because after landing at Lukla, the gateway to Mount Everest, the 12-day trek began. While they were initially hiking 10km a day, as the incline increased and oxygen decreased, there were times when they covered a stretch of mere 400m in four and a half hours! “The extreme conditions really tire you out. Imagine, even at temperatures as low as -8/-9 degrees Celsius, we were sweating,” shares Chef Vineet. But he feels extremely lucky that he and his team could achieve the goal and complete the task without falling sick. “Discipline was key,” he states, which meant getting adequate sleep and abstaining from alcohol, smoking and carbonated drinks throughout the trek. “It was very important to have people who got along well. Plus, I needed experienced chefs for the actual cooking,” says Chef Vineet. The core team comprised of six people along with two sherpas. The first to come on board was Chef Vineet’s son, 19 year old Varaul. Then there was Chef Tej Bahadur Thapa, chef de cuisine, Rasoi by Vineet, Gulf Hotel Bahrain, Chef Irshad Irshad Qureshi from Grosvenor House Dubai who have both worked for almost 15 years with Chef Vineet, who was thus familiar with their “steely determination”. And finally, there were two camerapersons from Delhi filming the entire experience. At an altitude where trekkers survive mostly on packaged foods or some very basic cooked food, this special pop-up ‘restaurant’ served some mouth-watering fare. The multi-course menu included vegetable momos, dal shorba spiced with locally procured wild juniper berries and jimbu (an herb belonging to the onion family, used extensively in some regions of Nepal), grilled chicken, yak butter rice, stir-fried beans with jeera, potatoes, fish masala (again, a local river fish), chicken masala and saffron sooji halwa with gold leaf, masala tea and chocolate. All this was dished out from just a pressure cooker, kadhai, handi and a pan and everything had to be cooked on a gas stove since charcoal fire is not allowed in this region. 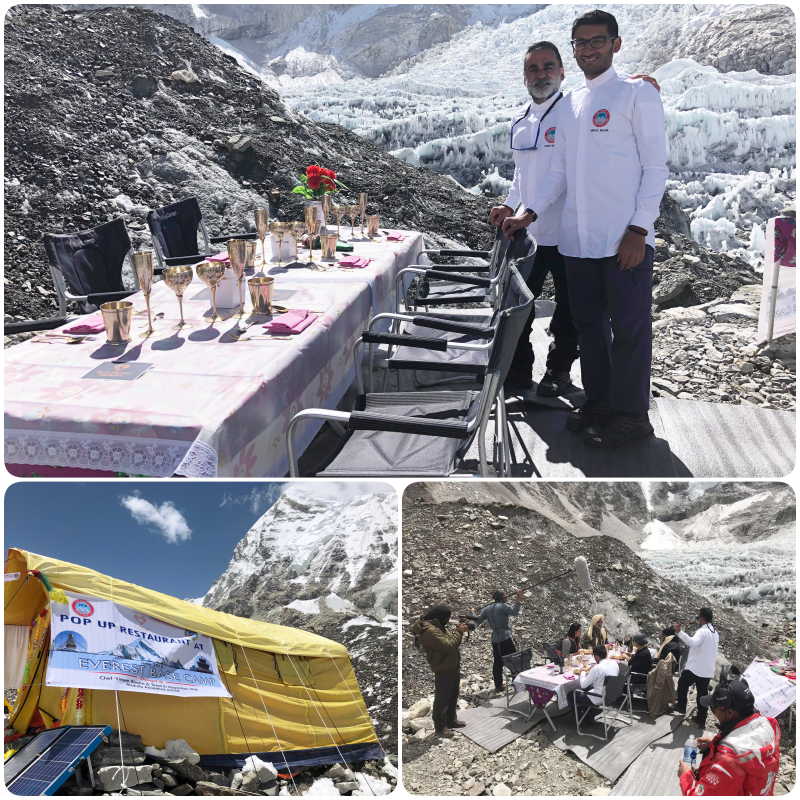 Hence the team had to think out of the box and devised various hacks to ensure that they could serve a fine meal to fellow trekkers as well as the diners who were flying in for this once-in-a-lifetime experience. “Even Gul Bahadur Sherpa gave some valuable tips since he had been a chef for summiteers multiple times.” The chicken was cut into thin slices, as were the potatoes; ginger and garlic were chopped extremely fine so that flavour profiles of the dishes could be maintained while cooking time could be reduced; and so on. A version of this article first appeared in The New Indian Express, Indulge - Coimbatore on July 20, 2018.